Field observations are particularly important in geotechnical engineering, because it is difficult to replicate in the laboratory the response of soil deposits built by nature over thousands of years. Detailed mapping of damaged and undamaged areas provides the data for the well-documented case histories that drive the development of many current design procedures. Thus, documenting key insights from earthquakes advance research and practice. This has been a primary goal of the National Science Foundation-sponsored Geotechnical Extreme Events Reconnaissance (GEER) Association since its inception almost 20 years ago. New technologies are continually employed by GEER teams to capture ground deformation and its effects. These technologies include Light Imaging Detection and Ranging (LIDAR) and Structure-from-Motion (SfM) image processing techniques for generating and visualizing three-dimensional point cloud data sets. New sensor deployment platforms such as Unmanned Aerial Vehicles (UAVs) are playing an integral role in the data collection process. Unanticipated observations from major events often catalyze new research directions. An overview of some of these recent integrated technology deployments and their role at the core of earthquake disaster analysis is presented. Important advancements are possible through post-event research if their effects are captured and shared effectively. There have been major improvements in scientific understanding and subsequent advances in earthquake engineering practice in the aftermath of significant earthquakes. Events that have significantly influenced earthquake engineering research and practice include the 1964 Niigata, 1964 Alaska, 1985 Mexico City, 1989 Loma Prieta, 1994 Northridge, 1995 Kobe, 1999 Kocaeli, 1999 Chi-Chi, 2004 Niigata-Chuetsu Oki, 2010 Haiti, 2010 Chile, 2011 Tohoku, 2010–2011 Canterbury, 2014 Cephalonia, 2015 Nepal, and 2016 Central Italy earthquakes. Each major earthquake potentially provides critical lessons that can save lives in a future event. Reconnaissance teams from the U.S. National Science Foundation (NSF)-sponsored Geotechnical Extreme Events Reconnaissance (GEER) Association strive to learn from these events and develop the insight and understanding that will enable scientists and engineers to evaluate and mitigate the effects of future earthquakes. In this paper, examples of recent GEER efforts are presented. Although originated as a NSF-funded activity in the United States for earthquake reconnaissance, GEER includes members worldwide and expanded in 2011 to include extreme events such as hurricanes, floods, and landslides. GEER works closely with other reconnaissance organizations to capture perishable data following major events so that the profession can learn from them. 1. Document geotechnical engineering and related effects of important extreme events to advance research and practice. 2. Employ innovative technologies for post-event reconnaissance. 3. Advance the capabilities of individuals performing reconnaissance of extreme events. 4. Train individuals to perform effective reconnaissance and facilitate access to equipment required for sensing and data collection. 5. Develop a coordinated response for geo-researchers to form effective reconnaissance teams and work effectively with organizations that focus on other disciplines. 6. Promote the standardization of measurement and reporting in reconnaissance efforts. 7. Disseminate timely and accurate post-event web-based reports and data. Since 1999, GEER (initially informally and subsequently formally) has responded to 58 events worldwide with 69% of those being earthquake related. The distribution of responses by event type for this period is shown in Figure 1. Figure 1. 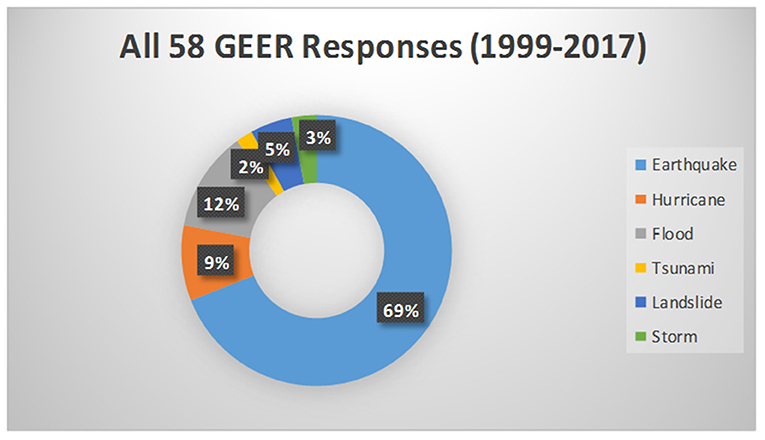 Summary of GEER Event Responses (1999–2017). The distributions of GEER responses globally to events from 1999 to 2011 and from 2012 to 2017 are shown in Figure 2. From 1999 to 2011, responses, which were dominated by post-earthquake activities, were comparable for North America and Asia (~30% each) and likewise comparable for South America, Europe, and Australasia (~15% each). In contrast, for the period 2012–2017, which reflects the period of the broader GEER event mandate, the distribution of events for North America (~46%) is comparable to the responses to the rest of the world combined (~54%). Figure 2. Distribution of GEER Responses Globally (1999–2011 and 2012–2017). For each of the 58 GEER responses, web-based reports were typically published within 2 months of completion of the field reconnaissance activities. These reports are archived on the GEER website (www.geerassociation.org) and are frequently used by other individuals and agencies planning post-event studies as well as for longer term research purposes. As a result of having core funding available from the NSF, GEER has been able to respond rapidly to events when needed. As such, GEER has typically responded to several events per year with 4–8 person teams. For larger events that require phased teams of larger size, GEER identifies a GEER team leader and facilitates this individual to submit a supplemental proposal for funding to the NSF. As noted previously, GEER has responded to 58 events worldwide since 1999. The timeline distribution of these responses is shown in Figure 3. While the average annual response rate since 1999 is about three, the response rate in the past 4 years has been about 7 and is reflective of both the broadening of the GEER mandate and the increasing number of unprecedented extreme events that have occurred. Figure 3. 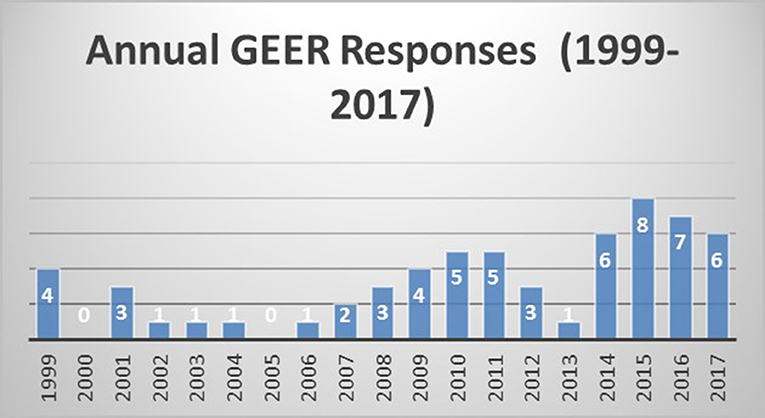 Number of GEER Responses by Year (1999–2017). Field case histories are the cornerstone of geotechnical engineering. Much of the data and information generated by an earthquake is perishable and therefore must be collected within a few days or weeks of the event. The removal of debris during recovery operations and restoration of transportation networks and lifelines quickly obscures observable significant damage, and hence, it obscures critical insight that could advance the profession. Geotechnical engineers should respond effectively so that potentially critical lessons are not missed. Some of the currently employed approaches utilized to evaluate geotechnical hazards, such as liquefaction-induced ground failure and its effects on buildings and buried utilities performance, are in need of updating. Often the evaluation and mitigation procedures recommended in engineering practice are based on previously documented field case histories that describe poor and good performance during significant events. For example, prevalent liquefaction triggering procedures are based primarily on empirical data that date back to the 1970's (e.g., Seed and Idriss, 1971). While they have been periodically updated in the intervening four decades (e.g., Youd et al., 2001; Boulanger and Idriss, 2016) they remain in need of further enhancements, particularly through the addition of well-documented case histories. Additionally, current simplified seismic slope displacement procedures, such as Bray and Travasarou (2007) and Rathje and Antonakos (2011), have been validated by demonstrating they capture the observed seismic performance of earth systems and natural slopes during actual events. These and other commonly employed geotechnical earthquake engineering procedures require continual re-evaluation and revision when insightful well-documented field case histories emerge. The emergence of high-resolution high-fidelity data sets has been a catalyst for some of these latest new insights. Unanticipated observations from significant events often define alternative research directions. As an example, the results of studies of soil liquefaction, especially those involving soils with a significant amount of fines, were motivated largely by observations of liquefaction and ground softening documented by NSF-sponsored GEER reconnaissance efforts after earthquakes in Turkey, Taiwan, and New Zealand. The careful documentation of liquefaction following the 1999 Kocaeli earthquake (Bray and Stewart, 2000) provided much of the data that advanced the profession's understanding of liquefaction of fine-grained soils and led to important new criteria for evaluating the liquefaction susceptibility of these soils (e.g., Bray and Sancio, 2006). Similarly, the documenting of liquefaction following the Canterbury earthquake sequence has yielded new insights into the settlement of structures on liquefied soils and procedures to evaluate them (Bray and Macedo, 2017). If the geotechnical engineering profession does not continue to look for new insights following future earthquakes with more extensive data sets, important research opportunities will be lost. The geotechnical engineering profession has a rich tradition of understanding the need to develop and apply new technologies and techniques that document the effects of earthquakes on urban infrastructure. The significant experience of geotechnical engineers in documenting field case histories and their leadership in implementing new technologies in reconnaissance activities positions them to advance the practice of geotechnical earthquake engineering. Appropriate techniques for performing effective geotechnical reconnaissance are delineated in a manual for GEER reconnaissance teams that was developed under the leadership of GEER member Rob Kayen assisted by other members of the Steering Committee (GEER, 2014). Soon after an extreme event occurs, it is crucial to identify the primary opportunities that the event presents for advancing the profession, while maintaining the flexibility required to adjust a team's focus based on early observations. As such, areas to investigate in greater depth are identified, and GoogleEarthTM is used to coordinate and record team member activities and their field observations. The data and information that can be collected by post-event reconnaissance teams includes high quality digital photographs of damage both from aircraft and from the ground. Aerial photographs taken after an event can be compared to those from existing databases to help define damage patterns that can provide invaluable planning insights. Reconnaissance activities may also include geologic and damage mapping, shear wave velocity profiling using the multi-channel analysis of surface waves (MASW) technique, and dynamic cone penetration tests (DCPT) at liquefaction sites. All observations are documented digitally and positioned accurately using GPS coordinates. Light Imaging Detection and Ranging (LIDAR) has more recently been used successfully to document damage to earth structures and ground failure after several extreme events. For example, aerial photography and ground-based LIDAR were used to document the Shiroiwa (White Rock) landslide, a large landslide produced by the shaking in the 2004 Niigata-ken Chuetsu, Japan earthquake, which adversely impacted a major road and adjacent bridge (Rathje et al., 2006). Another example is the detailed depiction of a failed highway overpass embankment in Chile, which is shown in Figure 4. The LIDAR image is, in reality, a detailed 3D digital surface photograph wherein each pixel is identified with its x, y, and z location. Efforts to utilize LIDAR to capture pre-event urban conditions (e.g., Borfecchia et al., 2010; Rovithis et al., 2017) will enhance the ability for post-event scans to capture ground movements. Figure 4. Ground-based LIDAR and optical images of a failed overpass embankment on Ruta 5 as a result of the 2010 Chile Earthquake (LIDAR survey by Kayen presented in Bray and Frost, 2010). Remote sensing, via spaceborne or airborne sensors, are other tools that have emerged as a crucial component of documenting the effects of natural disasters (Rathje and Franke, 2016). Commercial optical satellites routinely obtain sub-meter imagery that can be used to assess the geographical distribution of damage. Satellite imagery is geo-referenced to standard cartographic projections, and thus observations from the imagery can be fused with ancillary information such as geologic maps, topographic maps, or any other information that has been geo-referenced. Satellite imagery was used to document the distribution of landslides from the 2004 Niigata-ken Chuetsu earthquake (Rathje et al., 2006), to investigate the influence of geologic, topographic, and seismologic conditions on urban damage patterns from the 2010 Haiti earthquake (Rathje et al., 2011), and to measure sub-meter lateral spread displacements from the 2011 Christchurch earthquake (Rathje et al., 2017c). Another example is the integrated documentation of geotechnical damage along the primary north-south highway in Chile (Ruta 5) following the 2010 Chile earthquake by Frost and Turel (2011). Unmanned aerial vehicles (UAVs) are aerial robots that can be remotely controlled and can carry a wide variety of sensors. This technology is becoming more common as a platform for remote sensing in the aftermath of catastrophic events. The most common sensor deployed on a UAV is a digital camera. Although LIDAR systems can be deployed, they are used less often. 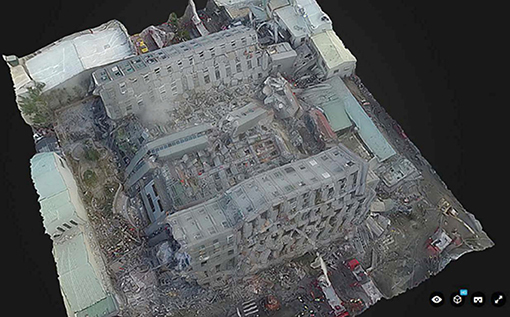 The images collected by a UAV can be used to visually examine earthquake effects over a large site from a broader perspective, but they can also be used to develop 3D point clouds of a site. The development of these 3D point clouds requires hundreds to thousands of images and integration of these digital images with stereo photogrammetry/computer vision techniques, such as Structure from Motion (SfM; Marr et al., 1978; Snavely et al., 2008). Notwithstanding the important emerging role of new hardware and software technologies as noted above, long-established and widely used traditional methods of data collection and information sources remain a critical component of GEER reconnaissance activities. Detailed mapping is possible with differential GPS devices, such as total stations. The importance of detailed mapping and surveying of damaged areas relative to general damage surveys cannot be overemphasized, as they provide the data for ground-referencing well-documented case histories that drive the development of many of the empirical design procedures used in earthquake engineering practice. Geologic maps, topographic maps, soil reports, and damage reports can be collected from various sources to help complete the picture of what happened and prepare for subsequent support studies that allow the profession to discern why it happened. Field observations, detailed mapping and measurements, and remote sensing technologies provide diverse data at different spatial and temporal scales. Together they offer opportunities to develop more comprehensive observations of damage. Additionally, the fusion of observations from different sources can lead to more comprehensive assessments of failure mechanisms. The data can also be integrated with other types of geospatial information, such as geologic maps, topographic maps, and Shakemaps of ground motion, to explore the relationships between damage and potentially important factors. This integration is facilitated by the fact that all damage observations can be geo-referenced to standard cartographic projections using GPS. Data fusion can be facilitated through open-access data repositories, such as the Data Depot data repository and Reconnaissance Portal available at the DesignSafe cyberinfrastructure for natural hazards engineering, and cloud-based data analysis tools that can access various datasets where they reside on the cloud. Against the backdrop of the event responses summarized above, GEER has a history of important contributions and accomplishments across a variety of activities. A selection of these earthquake-focused responses are noted below. • GEER deployed a series of teams to document effects following the 2014 Napa, California earthquake. The preliminary objective of the reconnaissance was to record the effects of strong shaking and ground failure on infrastructure, including the presence of liquefaction, landslides, and surface fault rupture. Within 24 h of the event, initial observations showed a remarkable absence of liquefaction or landslide induced ground deformations. However, there was well-defined surface rupture that produced various types of damage to structures and there was a pattern of damage to sidewalks and curbs suggesting sympathetic ground deformations within the vicinity of the fault zone. • A GEER team responded after the 2015 Gorkha, Nepal earthquake and its resultant aftershocks, which had a devastating impact on Nepal. The earthquake sequence resulted in nearly 9,000 deaths, tens of thousands of injuries, and left hundreds of thousands of inhabitants homeless. With economic losses estimated at several billion US dollars, the financial impact to Nepal was severe and the rebuilding phase will likely span many years. The overall distribution of damage relative to the epicenter indicates significant ground motion directivity, with pronounced damage to the east and comparatively little damage to the west. Although modern buildings constructed within the basin generally performed well, local occurrences of heavy damage and collapse of reinforced concrete structures were observed. Ground failures in the basin included cyclic failure of silty clay, lateral spreading, and liquefaction. • GEER teams deployed in a phased manner to the devastating earthquake sequence that struck central Italy from August to October 2016. Innovative reconnaissance approaches combined satellite imagery, local imagery from LIDAR and UAV-based photographs, and traditional field mapping was undertaken of structural damage patterns, landslides, surface fault rupture, and other effects. Observations made during the GEER reconnaissance activities are having an impact in research on fragility of masonry structures, ground motions from normal fault earthquakes, landslides in complex geologic terrain, and surface fault rupture. 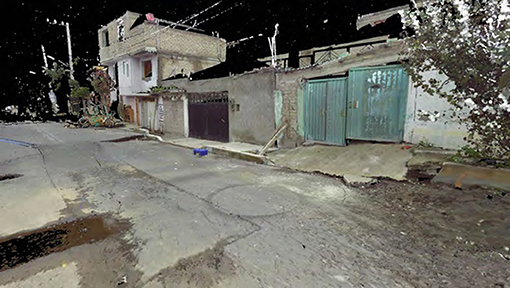 • GEER collaborated with researchers from the Universidad Nacional Autónoma de México after the Puebla, Mexico earthquake in 2017 to document the event impacts. Observed foundation performance in areas of structural damage varied considerably. Despite the high plasticity lacustrine clays that are predominant in Mexico City, numerous cases of seismic-induced settlements ranging from 1 to 15 cm were observed in the free-field soils around end-bearing pile-supported structures. Several cases of tilted structures (1–3 degrees) were observed. These structures generally were supported on a combined friction pile and mat slab foundation system. A common characteristic and lesson of the above listed responses, and indeed all GEER responses, is the reinforcement of the need for timely well-coordinated responses that allow for critical perishable data to be gathered. Apart from the inherent value of the data itself, it also provides critical insight into responses that need additional study and investigation, either through physical experimentation or numerical simulations. Further, the beneficial role of emerging advanced technology-based data collection continues to increase. Through the capabilities and creativity of its team members, GEER is recognized as an early adopter of advanced data collection technologies. From the adoption of handheld GPS systems in 1999 in Turkey, to dedicated mobile computing software data collection solutions in 2001 in India, to satellite and Terrestrial LIDAR Scanning based assessments of landslide distributions in Japan in 2006, to use of GoogleEarthTM photo logs in 2007 in Japan, to use of social media data to assess damage in 2013 in Colorado, to use of UAV platforms in 2014 in Chile, GEER teams have led the natural hazards reconnaissance community in adopting and deploying new advanced technologies. Apart from the inherent benefits associated with using these technologies in terms of data quality and quantity, they yield significant efficiencies in team performance and facilitate deployment of GEER resources in locations likely to yield the most impactful perishable data. Summaries of the specific use of these technologies following recent earthquakes are provided below. The Mw 6.3 Meinong, Taiwan earthquake struck the southern region of Taiwan on February 6, 2016. Left-lateral strike-slip fault rupture with minor reverse fault movement occurred on a previously unmapped fault and produced strong ground shaking and subsequent structural damage to the Tainan area. The ground shaking was accompanied by landsliding, liquefaction, and lateral spreading, and most liquefaction was confined to spots containing low-quality backfill soil (Sun et al., 2016a). A GEER reconnaissance team deployed rapidly after local emergency response efforts concluded, and they spent 1 week observing and collecting perishable data. Reconnaissance efforts focused on the geologic influence on ground motions, liquefaction of sandy soils, performance of buildings and foundations atop liquefiable soil, and performance of non-symmetrical and soft-story buildings. The GEER team observed that buildings with continuous, well-connected foundations or sitting atop basements performed well in areas where liquefaction occurred, whereas those without well-connected foundations incurred heavy damage (Sun et al., 2016a). Quantitative imagery was obtained by the GEER team using LIDAR to create 3D, interactive fly-through models that allow viewers to virtually enter and exit structures and quantify damage (Sun et al., 2016b). Aerial imagery via a quadcopter UAV also provided photogrammetry datasets with which to create 3D point cloud models using SfM. The point cloud data did not require control points on the ground; instead, the UAV photos for this reconnaissance were geo-tagged so that the relative locations of the viewpoints of each image could be used directly to create high-resolution, 3D models such as that shown in Figure 5. Figure 5. SfM model of the collapsed Weiguan Jinlong Complex developed using UAV photogrammetry (23.0052°N 120.261°E; Sun et al., 2016a). The central Italy earthquake sequence began with a Mw 6.1 earthquake occurring on August 24, 2016. This event caused significant damage, mostly to unreinforced masonry homes, in the villages of Arquata del Tronto, Accumoli, Amatrice, and Pescara del Tronto, causing 299 fatalities (Zimmaro and Stewart, 2016). Evacuation orders were put in effect before two more large earthquakes of Mw 5.9 and 6.5 occurred on October 26 and 30, 2016, respectively, and caused more damage to the villages of Visso, Ussita, and Norcia (Zimmaro and Stewart, 2017). The GEER reconnaissance team comprised of U.S. and Italian researchers and practicing engineers who documented the earthquake effects on slopes, villages, and major infrastructure. The reconnaissance team utilized a variety of UAVs equipped with high-resolution cameras to obtain photogrammetric imagery with which to develop 3D models of damage sites using SfM. Three types of UAVs were used to obtain imagery from the Central Italy earthquakes: a fixed-wing UAV, a quadcopter UAV, and a helicopter UAV, the specifications of each of which are available in Zimmaro and Stewart (2016). While the quadcopter and helicopter UAVs needed to be manually controlled, the fixed-wing UAV was programmed to follow a specific flight path using selected waypoints. 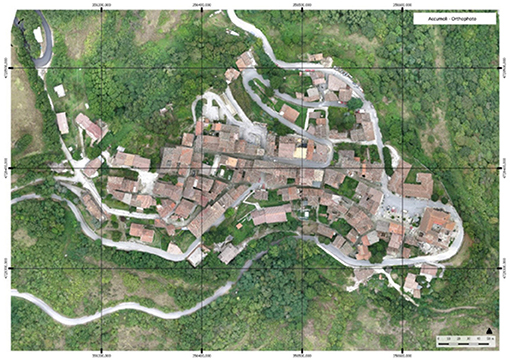 The automated capabilities of the fixed-wing UAV allowed the GEER team to produce an orthophoto of entire towns such as Accumoli shown in Figure 6. Figure 6. Orthophoto of the town of Accumoli developed with images obtained via fixed-wing UAV (42.96467°N, 13.24760°E; Zimmaro and Stewart, 2016). SfM proved to be especially useful in obtaining 3D imagery for significant landslide events occurring in rugged or steep terrain, in heavily vegetated areas, or in other areas with limited site access. 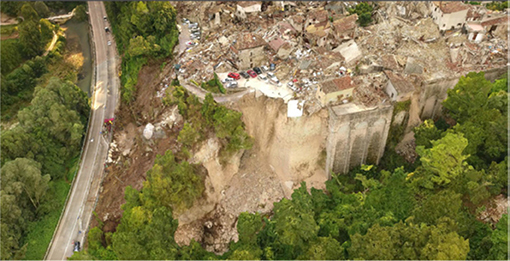 For example, Figure 7 shows a 3D image of a slope failure in Pescara del Tronto resulting from retaining wall failure. The SfM imagery and point cloud data can be used to perform further quantitative analyses post-reconnaissance, and this data can be further verified for accuracy by combining them with other geomatics technologies such as LIDAR. Figure 7. 3D SfM model of a slope failure in Pescara del Tronto possibly caused by a retaining wall collapse (N42.75109°E13.27208 °; SfM by Franke et al. presented in Zimmaro and Stewart, 2016). The 2016 Mw 7.8 Kaikoura, New Zealand earthquake initiated in the Waiau plains in North Canterbury on November 14 and ruptured dozens of fault segments in and north of Kaikoura. The rupture progressed north-eastward, producing surface fault rupture, strong ground shaking, landslides, liquefaction, and lateral spreading in the South Island of New Zealand and in the capitol city of Wellington (Cubrinovski and Bray, 2017). Due to the large impacted area from this earthquake, a collaborative effort between independent teams from GEER, GNS Science, and the University of Canterbury (UC) was undertaken to document the effects of the Kaikoura earthquake. One GNS-UC-GEER team documented the effects of surface fault rupture on the built environment and another GNS-UC-GEER team documented the occurrence of landslides and produced a thorough inventory of landslides. A joint QuakeCoRE-GEER team focused on earthquake ground motions, site effects, geotechnical effects, social impacts, and emergency response in Wellington and South Island (Bradley et al., 2017). Key observations and preliminary findings are presented in papers such as Cubrinovski et al. (2017, 2018). A unique feature of the response to this earthquake was the development of a detailed landslide inventory within 8 days of the event, and this inventory was used to guide the GNS-UC-GEER reconnaissance efforts. The detailed landslide inventory utilized both moderate resolution (15 m) Landsat 8 imagery and high resolution (1.2 m) WorldView-2 and WorldView-3 imagery. The Landsat 8 imagery covered an area of about 1,800 km2 and was used initially because it was available within 24 h of the event. The high-resolution imagery became available starting about 2 days after the event and the final set of 65 images covered a broader area of about 7,400 km2. Visual identification was used to identify the landslides, and this approach relies on the ability to see the landslides in the imagery. The simplest approach is to display the imagery as natural color, the color observed with the naked eye, and landslides are generally identified as locations where the vegetation is stripped away, exposing the underlying soil and rock material. The sharp contrast in color is easily distinguished when the proper color bands are selected and cloud cover is minimal to non-existent. To ensure that an area of stripped vegetation does not represent a landslide existing before the earthquake, pre-event imagery can be checked manually (Figure 8). Each landslide was identified as a polygon, and no attempt was made to differentiate the source area from the landslide debris. The total number of landslides in the final inventory was 1,331. The digital landslide inventory was brought to the field to guide reconnaissance efforts and was ground-truthed in real-time during a helicopter reconnaissance over the affected area. The landslide inventory was initially posted on the GEER website (Rathje et al., 2017b), but ultimately was formally published as a dataset within the DesignSafe cyberinfrastructure (Rathje et al., 2017d). Figure 8. Pre-event Google Earth imagery and post-event Worldview-2 imagery of Leder River landslide from the Kaikoura earthquake (173.2172 S, 42.5848 W). GNS-UC-GEER team members made effective use of LIDAR scanning to document earthquake effects both inside and outside structures at key locations of interest. Figure 9 shows a LIDAR scan from within Building S37 at CentrePort in Wellington showing an example of the cracking and settlement induced by liquefaction. The floor slab of this building was not pile-supported and settled up to 550 mm relative to adjacent pile-supported structures. Figure 9. LIDAR scan obtained inside Building S37 in CentrePort of Wellington showing cracking and settlement of the pavement around the buried precast concrete seawall (up to 550 mm of differential settlement occurred) (LIDAR survey by Olsen presented in Cubrinovski and Bray, 2017). Figure 10A shows measurements of liquefaction-induced settlement across CentrePort along the cross-section line shown in Figure 10C. The deck of King's Wharf, supported on driven timber piles as shown in Figure 10B, underwent lateral displacement due to lateral spreading in the fill behind it, which tilted and split the supporting timber piles. Figure 10D shows the manifestation on the Thorndon Wharf deck of differential settlement between the ground and a buried precast concrete seawall. The LIDAR scans provided point cloud data with which to measure small displacements on the order of centimeters due to liquefaction and lateral spreading, and they supplement SfM models gained via UAV photogrammetry. Figure 10. LIDAR scans of wharves at CentrePort Wellington showing deformation from the 2016 Kaikoura earthquake [LIDAR survey data from M. Olsen in Cubrinovski and Bray (2017)]: (A) East-west pre- and post-earthquake ground surface profiles from LIDAR surveys of Kings Wharf bulkhead and Thorndon Reclamation and wharf with representative images of: (B) timber pile damage at Kings Wharf (S41.280900° E174.784375°), (C) Thorndon Reclamation and wharf LIDAR digital elevation model, and (D) 550 mm ground settlement adjacent to pile-supported Thorndon Wharf (S41.277743° E174.789236°). The Mw 7.1 Puebla-Mexico City earthquake occurred on September 19, 2017, and affected Puebla, Mexico City, and Morelos, causing devastating structural damage and loss of life. Normal fault rupture occurred at a focal depth of 57 km in an instraslab subduction zone 60 km southwest of Puebla and 120 km southeast of Mexico City. Ground motion records indicated a higher frequency content in the soft clay underlying Mexico City than observed during the 1985 Michoacan earthquake. Strong ground shaking measuring an MMI intensity level of VII collapsed over 40 multi-story buildings in Puebla and Mexico City, leading to over 350 fatalities. A joint reconnaissance effort between the Universidad Nacional Autónoma de México (UNAM) and GEER took place between September 24 and October 6 to document the extent of earthquake-related damage and effects. An advance team and a main team documented their findings in a series of GEER-UNAM reports (e.g., Mayoral et al., 2018). The GEER-UNAM team deployed LIDAR stations and UAVs to survey the extent of damages and performed seismic surveys using tools such as MASW. They used ground-based LIDAR to model the interior and exterior of damaged structures and facilities. In the southern section of Colonia Del Mar, where extensive ground settlement was observed, GEER main team members utilized LIDAR to map ground cracking and ground failure patterns as shown in Figure 11. In Morelos, they used LIDAR to map the damage to the Rio Yautepec Bridge near the towns of Estacas and Yautepec. A 40 m wide landslide occurred adjacent to this bridge, damaging the roadway approach to the bridge and its southwest wing wall. The team gathered UAV imagery of this bridge and stitched the imagery together using SfM technology to create a 3D model of the damaged bridge as shown in Figure 12. The figure shows the landslide-related damage to the bridge as well as the 40 m width of the landslide and tension cracks forming up the slope behind the slide. In total, the GEER main team and advance team conducted UAV surveys at 23 different locations and LIDAR surveys at 5 locations, garnering over 260 GB of image data that allow researchers to continue to analyze damages even after the conclusion of field reconnaissance (Mayoral et al., 2018). Figure 11. LIDAR model showing ground failure in Colonia del Mar (N19.2851°, W99.0579°; Mayoral et al., 2018). Figure 12. 3D model of a landslide adjacent to the Rio Yautepec Bridge created using SfM from UAV images (N18.7306°, W99.1194°; Mayoral et al., 2018). • Levee Performance: Reconnaissance undertaken by GEER teams working in collaboration with Japanese researchers following crustal events in 2004 and 2007, as well as the Mw 9.1 subduction event in 2011, facilitated compilation of the most detailed inventory of seismic levee performance that is available worldwide. That data, in turn, spawned a large-scale research program sponsored by the California Department of Water Resources (DWR) to develop fragility models for flood control levee segments. Those fragility models, which are directly usable under certain conditions and more generally for validation of numerical models, are being used by DWR and others (e.g., US Army Corps of Engineers) to evaluate seismic risk to flood control levee networks in California's central valley. Such assessments are crucial for water agencies and the communities they serve (e.g., Sacramento). • Consequences of Urban Liquefaction: The GEER reconnaissance efforts following the 2011 Tohoku-Kanto Earthquake in Japan and the 2010/2011 earthquake sequence in New Zealand brought renewed attention to the fact that buildings on improved ground or piles generally perform well by themselves, but the surrounding liquefiable ground and lifelines were often extensively damaged. Further, adjacent structures were observed to affect each other's performance due to dynamic coupling and excessive residual tilt. These events revealed the need for liquefaction remediation to achieve satisfactory performance at a scale beyond that of an isolated building and has stimulated research in this area. • New Liquefaction Evaluation Procedures: Much of the data collected in the reconnaissance efforts following the 2010/2011 New Zealand events were critical to supporting research which has advanced the state of the art in liquefaction evaluation. Examples are the refinement of the Boulanger and Idriss (2016) CPT-based liquefaction triggering procedure, which used New Zealand data to improve its MSF and FC adjustments, and the development of the Bray and Macedo (2017) simplified liquefaction-induced building settlement procedure, which used the building settlement and performance data to calibrate their numerical simulation and to validate the simplified procedure. • Enhanced Performance of Utility Pipelines: Based on research following the Darfield earthquake (e.g., O'Rourke et al., 2012), high density polyethylene (HDPE) water mains replaced damaged portions of the water distribution system in the Burwood and Darlington areas of Christchurch. No damage was observed in these HDPE pipelines after the Christchurch, 13 June, and 23 December 2011 earthquakes, even though this area was subjected to severe liquefaction, with settlement and lateral spreading as high as 3 m. This deployment of HDPE ductile pipelines represents the first documented case where HDPE pipelines installed for earthquake resistance have been subjected to large liquefaction-induced ground displacements. These developments are extraordinarily important for lifeline earthquake-resistant design and construction. Over the past two decades, GEER has made significant advances in achieving its objectives. At the same time, the organization needs to both continue undertaking similar activities as it has over the past two decades while adapting to and leveraging the significant new opportunities that exist as a result of the establishment by the NSF-sponsored National Hazards Engineering Research Infrastructure (NHERI), and in particular, the DesignSafe cyberinfrastructure (http://www.designsafe-ci.org, Rathje et al., 2017a) and the RAPID post-disaster response facility. To achieve these dual objectives, GEER has identified a set of tasks that build on past successes and accomplishments yet seek to advance the science and engineering of post-disaster reconnaissance. GEER will continue to coordinate the response of the geotechnical hazards community to future events. In light of the coordinated role that is now feasible under NHERI, GEER will implement additional strategies and protocols to engage with the broader community. For example, protocols for utilizing the new technologies now available to the hazards community through the NHERI RAPID facility will be developed. Similarly, protocols for utilizing the NHERI DesignSafe cyberinfrastructure during field reconnaissance activities as well as for archiving and disseminating data collected during GEER responses will be developed. Incoming GEER leadership has already begun discussion with leadership of the new NSF-supported Social Sciences Extreme Events Reconnaissance (SSEER) and Inter-disciplinary Science and Engineering Extreme Event reconnaissance (ISEEER) platforms to develop guidelines and protocols for coordination of joint reconnaissance activities. Similar collaborations are anticipated with other disciplinary platforms when they are established. Early adoption of advanced technologies for post-disaster reconnaissance will continue to be a cornerstone of GEER activities in the future. Elements of this activity will be facilitated by access to the NHERI DesignSafe cyberinfrastructure and the technology available through the RAPID facility. At the same time, GEER actively seeks out researchers and practitioners with new technologies that can enhance the quality and quantity of data collected. As has been a requirement for all GEER reconnaissance activities since 1999, all data has to be geo-referenced. Not only does this allow for rapid integration of data from multiple different sources but it facilitates the sharing with and utilization by others of data collected by GEER teams. GEER will enhance its utilization of social media data as part of future reconnaissance efforts. In-coming GEER leadership (Bland and Frost, 2012; Dashti et al., 2014) has had prior involvement in this area and will lead new GEER efforts to use data harvested from social media to complement that from both experts as well as citizen scientists in identifying features of interest to study. Another focus area for GEER will be to better use data mining techniques during both the preparation for response activities as well as in preparing post-event reports. With the ever-increasing amount of digital data archived and readily available, GEER can enhance both the manner in which it plans reconnaissance activities as well as documents team findings. This can also be facilitated by expanded use of GEER teams to include a number of individuals who are data experts but do not necessarily travel to the field. One of the primary objectives of GEER reconnaissance activities is to acquire the perishable data upon which well-documented case histories can be developed through follow-on field, laboratory, and numerical studies. Historically, many of these case histories have been event-driven. For example, only by observing the performance of systems and infrastructure in actual events do deficiencies in understanding become evident and lead to further studies. In short, many of the case histories might be described as reactionary to event observations. With the significant large-scale experimental and simulation capabilities now available through the NSF NHERI and similar infrastructure, there is also an opportunity to identify potential behaviors and phenomena during these experiments that can help guide future reconnaissance activities and thus research topics. In other words, there is now an opportunity to identify, ahead of an event, possible effects of interest to allow for enhanced calibration and validation of experimental and numerical simulations. To facilitate this active identification of potential topics of interest, GEER will solicit input from the relevant NHERI equipment facilities and the simulation center to expand and enhance the existing “Focal Points for GEER Reconnaissance Efforts” document for future responses. The establishment and existence of the DesignSafe cyberinfrastructure as part of the NHERI has opened up significant opportunities for streamlining the flow of data from initial collection in the field to access by other researchers, and subsequent analysis and integration of data using the tools available in the DesignSafe Data Depot and Discovery Workspace. As GEER moves to the next phase of its existence and operation, focused effort will be devoted to leveraging this cyberinfrastructure. As more data intensive and computation intensive techniques are used to collect field observations of earthquake effects, the challenge becomes how best to archive these datasets for long term use and re-use. This is particularly the case for high resolution point clouds from LIDAR and SfM, although all reconnaissance efforts would benefit from more formal and organized publishing of field data. The DesignSafe cyberinfrastructure web platform provides a data repository and data analysis tools that can be used to share and publish reconnaissance data (Rathje et al., 2017a). Reconnaissance data can be published with a citable Digital Object Identifier (DOI) in the DesignSafe Data Depot and those data can be easily accessed through the DesignSafe Reconnaissance Portal. Moving forward, the detailed data collected by GEER reconnaissance teams will be archived at DesignSafe and the GEER reconnaissance reports published on the GEER website. Knowledge can be advanced through the careful documentation of the effects of important earthquakes. Recent GEER studies and associated reports illustrate what effective post-earthquake geotechnical reconnaissance can accomplish. GEER reconnaissance efforts have succeeded in large part because of the value that geotechnical engineers place on learning from earthquakes and on developing well-documented case histories that form the cornerstone of understanding for the geotechnical engineering profession. The death and destruction resulting from recent events emphasize society's need to improve its resilience. It is critical that the geotechnical engineering profession continues to capture the perishable data that enables it to understand which design procedures result in good performance and which procedures need improvement. With robust field data and observations and the resulting insights and knowledge, geotechnical engineering researchers can advance key concepts in performance-based earthquake engineering. In this context, GEER helps turn disaster into knowledge to enhance resilience. This material is based upon work supported by the National Science Foundation (NSF) Grant No. CMMI-0825734, CMMI-0825760, CMMI-0825507, CMMI-1266418, CMMI-1265761, CMMI-1300744, and CMMI-1724866. Any opinions, findings, and conclusions or recommendations expressed in this material are those of the authors and do not necessarily reflect the views of the NSF. GEER is made possible by the vision and support of the NSF Geotechnical Engineering Program Directors: Dr. Richard Fragaszy and the late Dr. Cliff Astill. GEER members also donate their time, talent, and resources to collect time-sensitive field observations of the geotechnical effects of extreme events. Bland, H. M., and Frost, J. D. (2012). “Opportunities and considerations for smart phone applications and mobile social media in post extreme event reconnaissance data collection,” in Proceedings of 6th Congress on Forensic Engineering (San Francisco, CA: CD-ROM), 505–514. Bradley, B. A., Comerio, M., Cubrinovski, M., Dellow, S., Dizhur, D., Elwood, K., et al. (2017). M7.8 Kaikoura, New Zealand Earthquake on November 14, 2016. A QuakeCoRE, GEER, and EERI Earthquake Reconnaissance Report. EERI, Oakland, CA. Cubrinovski, M., Bray, J. D., de la Torre, C., Olsen, M., Bradley, B. A., Chiaro, G., et al. (2017). Liquefaction effects and associated damages observed at the Wellington centreport from the 2016 Kaikoura earthquake. Bull. N. Z. Soc. Earthquake Eng. 50, 152–173. Dashti, S., Palen, L., Heris, M., Anderson, K. M., Anderson, S., and Anderson, J. T. (2014). “Supporting disaster reconnaissance with social media data: a design-oriented case study of the 2013 Colorado floods,” in Proceedings of the 11th International Conference on Information Systems for Crisis Response and Management (University Park, PA). Frost, J. D., and Turel, M. (2011). Satellite, airborne and ground based imaging of earthquake damage and geotechnical hazards. J. Highway Transport. Res. Dev. 28, 41–48. GEER (2014). Manual for GEER Reconnaissance Teams V.4, Geotechnical Extreme Events Reconnaissance (GEER) Association GEER Manual v.4 2014-10-28. Available online at: http://www.geerassociation.org/media/files/Important%20Docs/GEER_Recon_Team_Manual_2014_v4.pdf (Accessed November 20, 2017). O'Rourke, T. D., Jeon, S.-S., Toprak, S., Cubrinovski, M., and Jung, J. K. (2012). 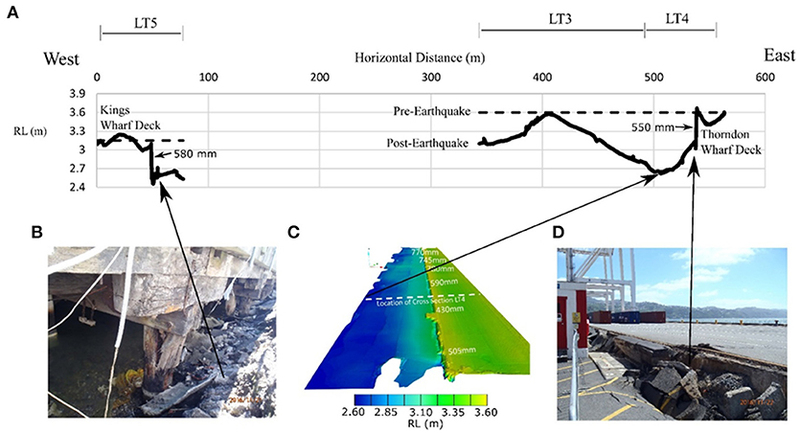 Underground Lifeline System Performance During the Canterbury Earthquake Sequence, 15 WCEE. Lisbon: CD-ROM. Rathje, E., Little, M., Wartman, J., Athanasopoulos-Zekkos, A., Massey, C., and Sitar, N. (2017b). Preliminary Landslide Inventory for the 2016 Kaikoura, New Zealand Earthquake Derived From Satellite Imagery and Aerial/Field Reconnaissance. version 1. Quick Report 1, ver. 1 of the forthcoming NZ-US Geotechnical Extreme Events Reconnaissance (GEER) Association Report on the Geotechnical Effects of the 2016 M7.8 Kaikoura Earthquake. Seed, H. B., and Idriss, I. M. (1971). Simplified procedure for evaluating soil liquefaction potential. J. Soil Mech. Found. Divers. 97, 1249–1274. Sun, J., Hutchinson, T., Clahan, K., Menq, F., Lo, E., Chang, W., et al. (2016b). Geotechnical Reconnaissance of the 2016 Mw6.3 Mainong Earthquake, Taiwan, Part 2: Remote Sensing Data and Models. A report of the NSF- Sponsored GEER Association Team, GEER-046, Ver. 1. Zimmaro, P., and Stewart, J. P. (2017). Engineering Reconnaissance Following the October 2016 Central Italy Earthquakes. A report of the NSF- Sponsored GEER Association Team, GEER-050d, Ver. 2. Copyright © 2019 Bray, Frost, Rathje and Garcia. This is an open-access article distributed under the terms of the Creative Commons Attribution License (CC BY). The use, distribution or reproduction in other forums is permitted, provided the original author(s) and the copyright owner(s) are credited and that the original publication in this journal is cited, in accordance with accepted academic practice. No use, distribution or reproduction is permitted which does not comply with these terms.